[of Tapping Flamingo- found by clicking here] . I know there are a gazillion blogs to see so I will be brief and to the point. At the left you can see the soup I sent, which included a focal of handmade polymer clay beads in the Mokume Gane technique, I also hand made a clasp and sent these along with quite a few coordinating pretties. I included some sari ribbon. I was gifted a bit of this in a previous BSBH and because of that I now incorporate fibers in some of my work so I wanted to pay that forward. I also sent an extra little gift of mokume just to show the color and versatility of this polymer medium. The next photo shows what Terry sent to me. 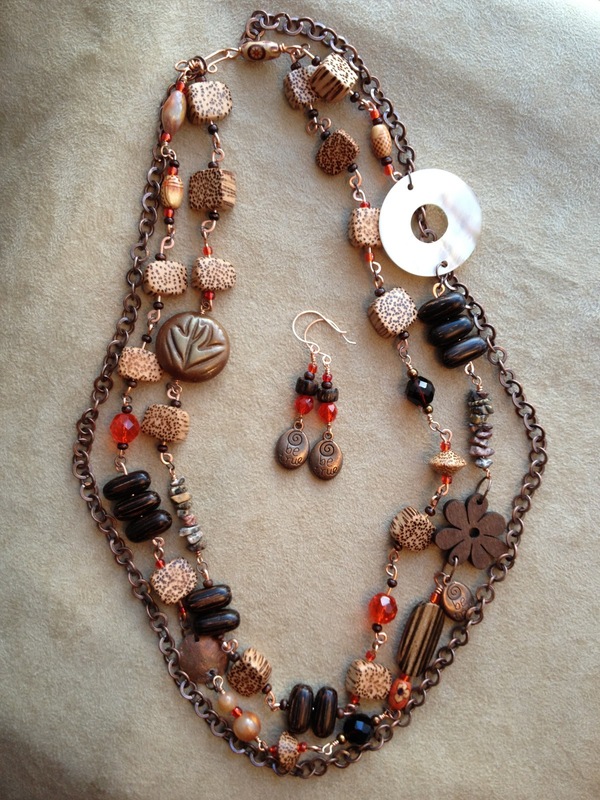 She handmade a fun focal and clasp and sent a big selection of wood, shell and chip beads. This was a good collection with a very 'tribal' feel and nice because it's not something I might choose for myself. That's why we do bead soup, to be pushed out of our comfortable little boxes! Finally, my finished product and some 'glamour shots' from close-up. I decided on a wire wrap, link/ sectional approach. 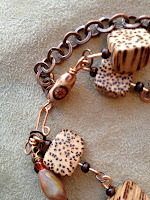 From my own stash I added a few faceted glass crystals, some polymer clay beads, a re-purposed hammered penny & a length of antique copper tone chain I am really pleased with the way this turned out. I think it will be a great summer time statement piece. and any comments you care to leave. If you are a follower/friend, I thank you very much. If not, I hope you might consider joining me on my journey. 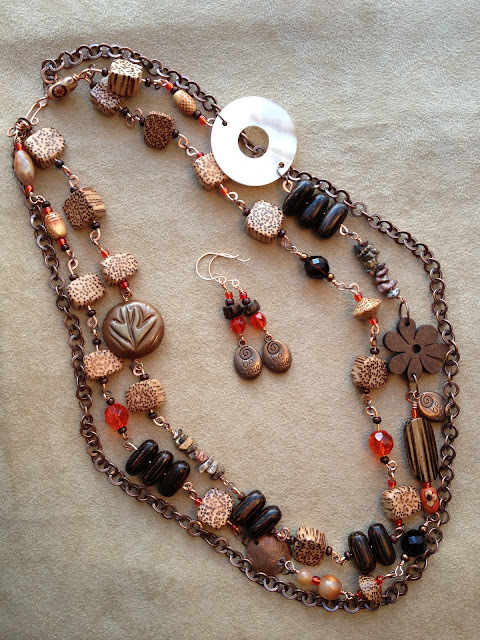 I love the tribal yet elegant style of this necklace, beautiful work! I like how you linked the necklace together, it's got it's own rhythm. The pop of color is excellent! Very organic! 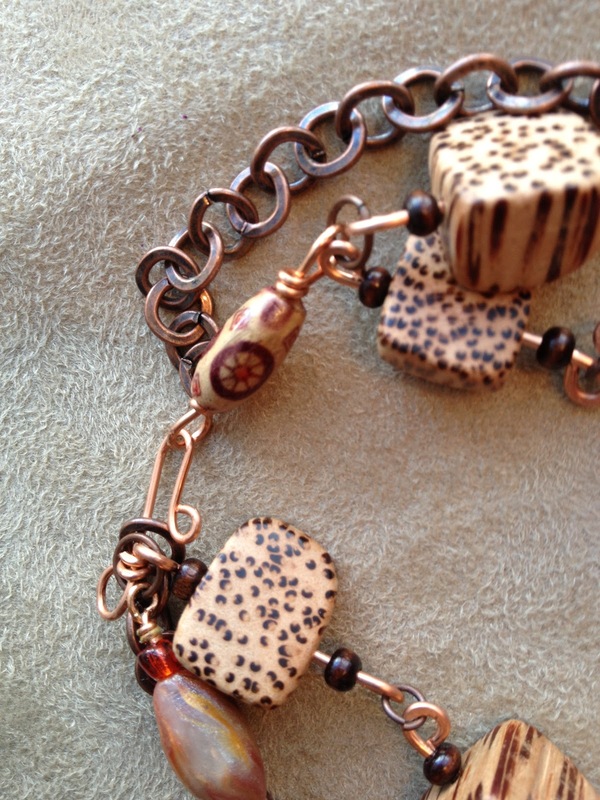 Love the wood and copper together, it's a beautiful combo. multi-strand necklace very stunning! congrats! Elegant and still funky; that's quite an achievement. I feel like you could dress this up or down. Very wearable. Stupendous! I love the "tribal look" Excellent work! I love that - it does look like it will be great for summer wear! Awesome, Tammie! Right out of the "dark continent", shades of Lauren Bacall and Humphrey Bogart! I'm dating myself here, aren't I?? :-) Love it. Wow, that's a gorgeous necklace, love the 3 layer look. What a great necklace Tammie. It sure will make a statement. I love the combination of textures and patterns. Is it heavy? Have a lot of fun wearing it. I'm off to visit your partner. Charming necklace, Tammie - wonderful colours and arrangement! Good job Tammie. You used your soup well. Oh Tammie, your necklace is just dreamy. I adore your three-strand design. I always seem to have a bit of an issue with multiple strands, but you carried it out effortlessly. Or at least it seems effortless. . .and that's kinda the point isn't it? WELL DONE!! What a great necklace! I just love the colors and I am in awe with how easy you make multistrands appear to be. Reminds me of the South seas and nuts and wood...Love the creations. Awesome design! 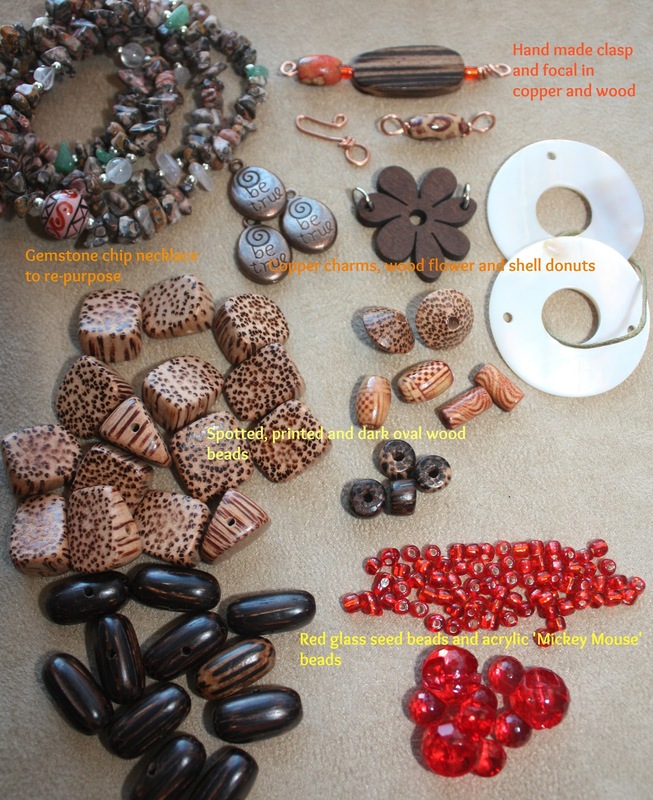 The positioning of the shell doughnut is perfect and how you coordinated your beads... I'm jealous. Great work! Hey Tammie.. I soo love your work. Gorgeous designs. Your piece looked exactly like what should have been made from those beads - really nice. Hi. 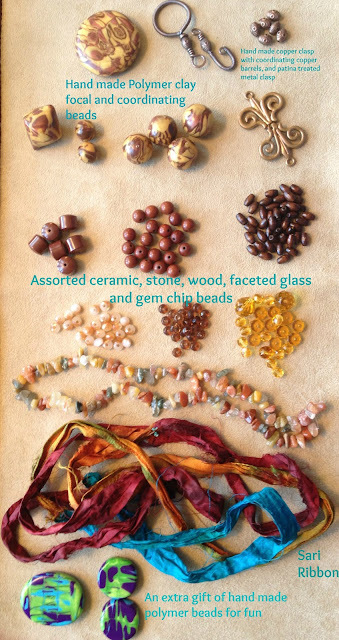 When I first saw the bead soup that you received I thought to myself what a great pile of beads. I love those materials. But, then when I saw what you did with them....I was truly wowed. You put them all together in such a beautiful way. I really am wowed by that. How beautiful that would look on a dress in Hawaii!!! Just an idea. Great job! Sorry I'm late, but, You did a fantastic job! You sure stepped up the to the plate with these pieces!!!! It was so fun working with you! 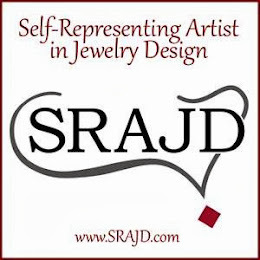 :) I love your jewelry that you made from your bead soup! It's truly amazing! I love the way you pulled all of those wonderful pretties together! 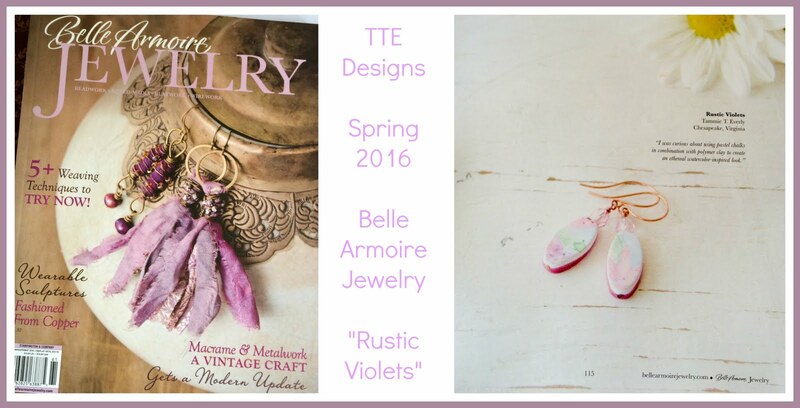 Beautiful Necklace with a little whimsey, luv it. I do love those earrings and necklaces. Well done! Really great! The necklace/earring set would be super fun to wear, and it looks like it would complement many different kinds of outfits. Nice pieces! I really like the necklace...Beautiful job! I never know what to do with red, because it's so bold. But you used just the right amount of it and created a piece with lots of balance. 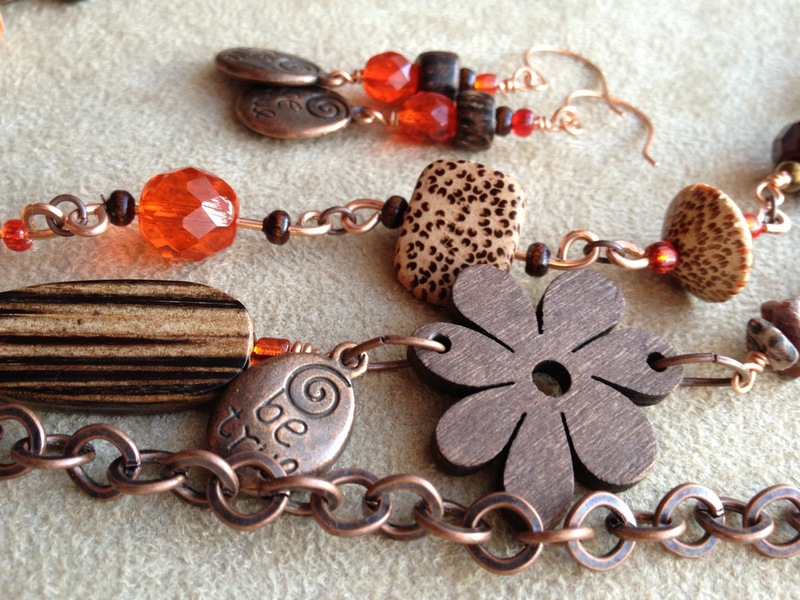 It's warm and earthy, yet bright and cheerful. Chunky and substantial, yet light and airy at the same time. And I love all the little tidbits...the penny, the polymer, the charms. Love it!